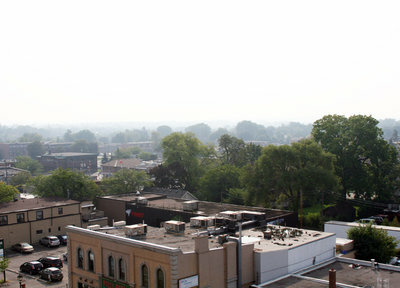 A colour photograph looking east from All Saints' Anglican Church Steeple. The Whitby Hotel (now Pizza Nova and Mom+Baby Depot) can be seen in bottom corner of the photograph. Click the link on the right side of the page to see the same view in May 1964. Looking East from All Saints' Anglican Church, September 10, 2013, Sarah Ferencz. Whitby Archives D2013_006_012.